Just few weeks ago I wrote about the Medieval Market/ Renaissance Fair here at my hometown. I also mentioned that we would be going to a much bigger Market this months and today was the day for the journey. The whole event is called “MitterlalterlicherPhantasie Spectaculum” and is the biggest traveling cultural festival in the world. Nearly every weekend during the warmer months it is in another city with over 2500 people and over 1000 tents to bring the Medieval World back to our time. The closest location of this traveling market is in another city roughly 45 min by car away from us. Last time I had been there was 10 years ago! First of all it seems that the whole town needs to participate somehow as there are just so many visitors coming. As most towns here are in the middle of farm land they just rent some fields and use them as parking lots. Through this all visitors can find some parking space BUT it results in a long journey to the festival grounds at the park in the middle of the town. Last time I was there the ticket price was around 10-15 Euros or so and it got a rather huge increase as it is now 30 Euros per person, eeeek nearly 100 Euros for us! But we both think it was worth it as it was a really special day. So whats the difference to the free entrance market in my hometown last month? For starters it is so much bigger with multiple actors and bands performing the entire day. 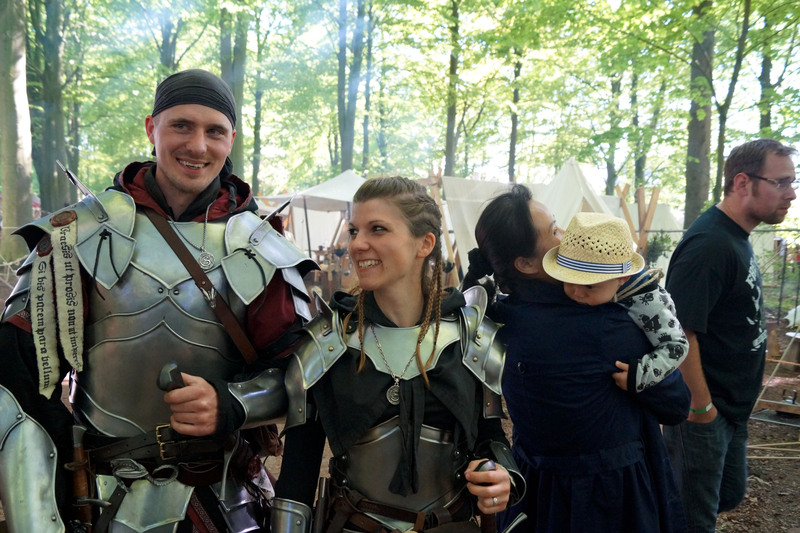 Then there are so many workshops you can participate such as pottery, blacksmithing and there are real knight battles (with jousting etc) on the field next to the park, many gleemen, random activities happening and tons of stuff to buy. The place was just full with people and many dressed up accordingly. When my wife saw how others were in chainmail or in beautiful dresses she decided for us that we will do the same for the Market in October. Though I said last time that we will try to find something nice for Nathan we failed to get him any clothes as he is just too small right now so he had to settle for a mini wooden sword. As he is a fast learner he mastered the skill of one-handed sword fighting within a couple of hours and attacked (unsuccessfully) a dark knight. After that he decided that sword fighting is not his strong point and abandoned the sword for the rest of the day. All in all I can say that this was a really great day even though my current health situation was making everything a bit harder to get around. Took him only 5 years! Would you like to visit such renaissance fair? It kinda looks like Cosplay just Medieval style. I guess it must be very popular nowadays with the whole Games of Throne craze! It surely was pricy but when I think what entertainment was offered us for the whole day it is pretty okay. I will try my best. Yesterday I already checked few websites but the prices are kind of insane.-. What I love about these kinds of big fairs is that you will rarely get bored with so many things to explore about another culture or another time. However, what I find hard is how much time to spend at a certain booth of exhibit, and what to spend my money on. Usually if the entrance fee is expensive, I will try to avoid buying anything there. 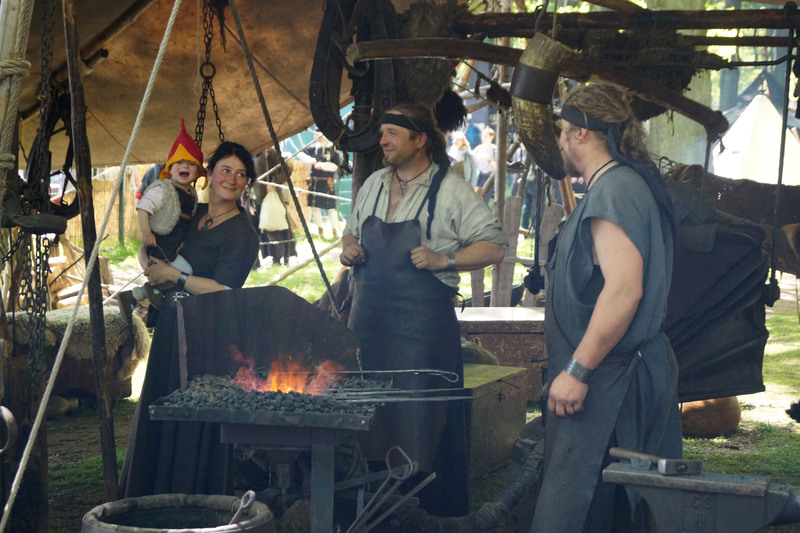 The only “faire” I’ve been to was held outside Baltimore, and it was quite cheesy. From the photos, the one you attended looks more educational and better produced. Yes, yes, yes! I most certainly want to go to a fair like this. Anything old or a replica of old gets my vote. Did you have any roast pig? Next time you must and write all about it! Actually, the reason I’m so curious is I’ve never had roast pig and would like to see what it tastes like. Medieval fairs and knights are definitely very European. I think we breezed by one when we were in Great Britain, just outside of London. It was so surreal..to us. Wow, never seen anything like this. Really? I Always wondered how to avoid them, they are all over the news in TV, radio and Internet. I only remembered to go there due goal, the advertisements all over the place. Now my wife is hooked as well (who couldn’t care less about these things before) and wants to dress up as well!